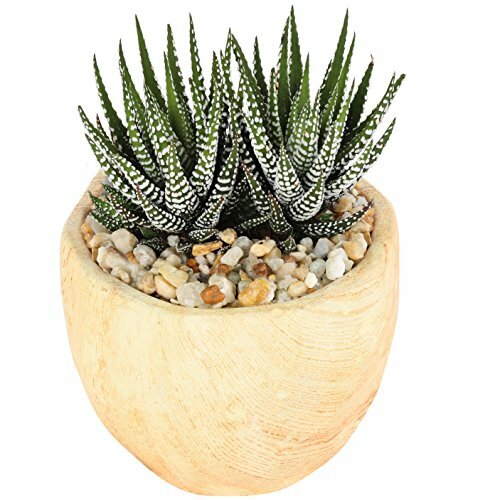 A native of South Africa, the compact Haworthia succulent features upright, tough rosette growth with dark green leaves detailed by outside white bands that give it a striped, Zebra-like appearance. Drought tolerant, it easily fits in small spaces on windowsills, bookshelves, and tabletops. It comes in a wood textured ceramic container topped with river rock. Succulents grow best in medium to bright light. The shallow-rooted, short-stemmed succulent can grow to be 2 to 3 inches tall and 4 inches wide, and can tolerate weeks without water. Protect from hot or cold drafts and fertilize once or twice per year with a general-purpose houseplant fertilizer. Avoid exposing it to temperatures below 50 degrees F (10 degrees C). Succulents come in a variety of beautiful shapes and sizes, and Costa Farms' expert growers do their best to select plants that are similar to those pictured. Keep in mind that the plant you receive may be a variation based on availability, environment, and time of year. Grown by Costa Farms, a family-owned farm based in Miami, Florida that grows more than 1,000 varieties of high-quality plants for in and around your home. Altman Plants Succulents Windowsill & Indoor Collection 8 Pack, 2.5"